* 1.Push Button Quick-Realease Spool. * 2.Adjustable Click Drag System. * 3.Ergonomic Designed for Comfortable. * 4.The setups can provide precision casts. * 5.Very light-weight, and easy to dismantle. * 6.The reel requires only a rinse in fresh water. 1 x Original PackgingSeaKnight® MAXWAY fly reel is built tough for saltwater fly fishing and freshwater fly fishing for gamefish.Ergonomic Designed for Comfortable. SeaKnight® MAXWAY Fly Reels are smooth, amazing fly reel center disk drag unit is o-ring sealed to keep out water and sand. The exceptional SeaKnight® MAXWAY waterproof fly fishing reel includes a fantastic CNC precision machined frame and spool, 1:1 gear ratio, 3 Ball Bearings. 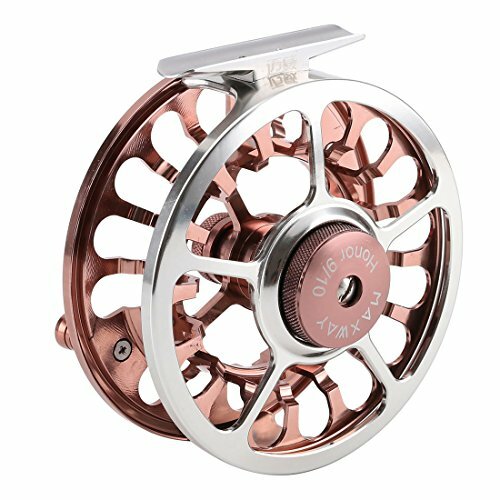 This balanced design, ultra-light large arbor fly fishing reel comes in 4 sizes: 3/4 70 mm dia, 5/6 80 mm dia, 7/8 90 mm dia,9/10 100 mm dia. Adjustable Click Drag System.Very light-weight, and easy to dismantle.